Steak is one of the few things I don’t put on the grill. I’m usually too careful with my money to risk overcooking a good piece of meat (and why have steak at all if it isn’t going to be a good piece of meat?). I usually go for bone-in ribeye of 3/4 to 1 inch thick. I recommend pulling the steak out of the fridge about an hour before cook time (the same time I put the baked potato in the oven). You want it to come to room temperature. When the potato is done, crank the temperature of the oven up to 450 degrees F. Put a high flame under a cast iron skillet and let it heat up. I salt both sides of the meat and wait for the pan to get screaming hot. After putting just a little oil in the center of the pan, the steak goes on the first side for 2 minutes. Then, flip it over for two minutes searing on the other side. Slide the hot pan into the oven for 2 minutes for medium rare or up to 4 minutes for medium. This will depend on the thickness of the steak. You are aiming for around 120 degrees F for rare, 125 degrees F for medium rare, 130 degrees F for medium. 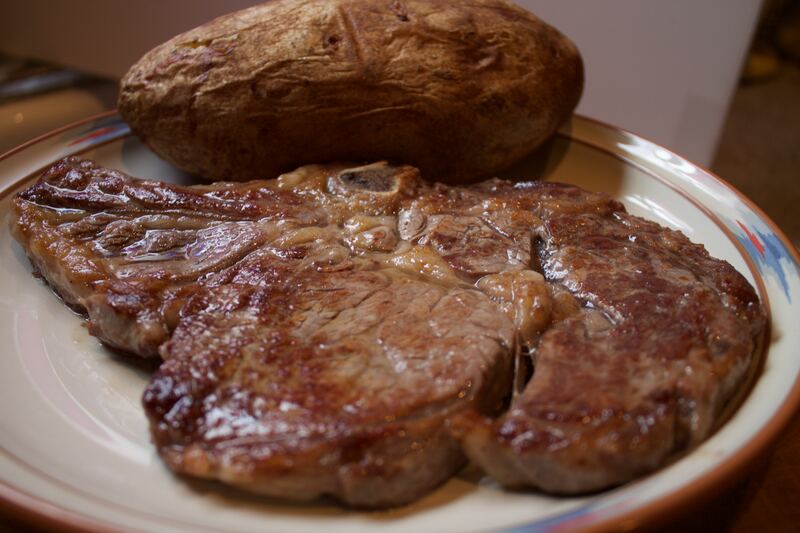 Remove the skillet from the oven and place the steak on a plate but do not touch it for 5 minutes. Don’t worry! It will still be warm and delicious but a lot more juicy when you cut into it if you wait. 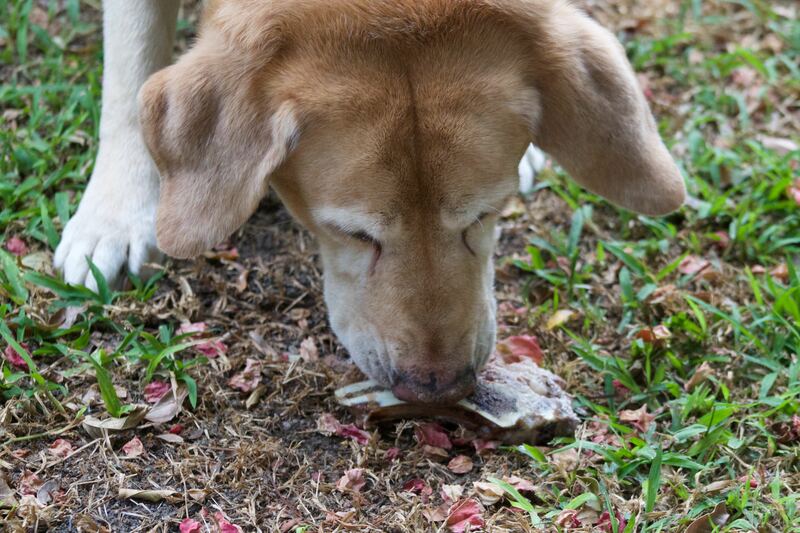 I let my dog, Daisy, gnaw on the bone for a little bit after I’m done with dinner.